Today, July 14, we stand precisely nine years from our closest approach date with the ninth planet and her moons. Next week, on July 19, we will celebrate the six-month anniversary of our launch. New Horizons has a long way to go, but we're on our way! Alan Stern with New Horizons in the Atlas V Vertical Integration Facility hangar just after RTG (radioisotope thermoelectric generator) installation and arming on Jan. 13, 2006. New Horizons is visible through the hatchway in the Atlas V nose fairing. 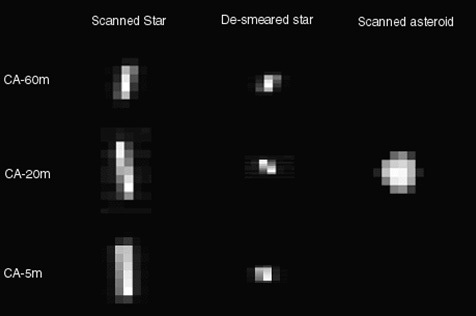 New Horizons successfully conducted an asteroid flyby test of its moving target image motion compensation system (more on that below). 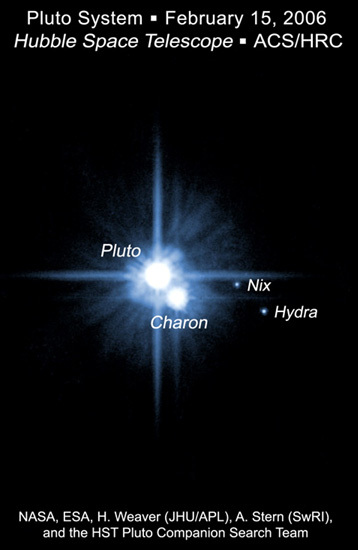 The names we nominated for Pluto's two recently discovered small moons, Nix (the inner one) and Hydra (the outer one), were approved by the International Astronomical Union (IAU). Continued successful testing of the SWAP and PEPSSI plasma/high energy particle detector suite aboard New Horizons. Successful beam mapping tests of the REX-High Gain Antenna pattern. Uploading of an updated (yes, "new and improved") release of the onboard fault detection and correction "autonomy" software that watches over New Horizons. A spin-up maneuver that took New Horizons out of three-axis attitude control and placed it back in its 5 RPM axial spin to save fuel and place us in a more robust mode for the upcoming flight software loads of August and September. Traveling more than 70,000 kilometers (43,500 miles) per hour, 24x7, New Horizons is now closer to Jupiter than it is to the Sun; check this out at http://pluto.jhuapl.edu/Mission/Where-is-New-Horizons/index.php. By the end of July our ship will be passing the distance of Ceres, the largest member of the asteroid belt and a relic of our solar system's planetary formation days. Ceres and Pluto have something important in common: They are both dwarf planets. Ceres is about twice as small but roughly as dense as Pluto, despite the fact that it formed about 10 times closer to the Sun. With the discovery of other dwarf planets in the Kuiper Belt it has become clear that the solar system we once thought of as consisting of four terrestrial planets, four giant planets, and a misfit planet named Pluto isn't that at all. In fact, the solar system appears to contain at least dozens of dwarf planets — perhaps more — quantitative population estimates as high as 1,000 dwarfs can be found in the technical literature. No dwarf planet has — as yet — ever been visited by a spacecraft, but in 2015 that will change dramatically. If all goes well, not only will New Horizons fly by Pluto, but NASA's Dawn mission will visit and go into orbit about Ceres as well that year. Together these two missions will revolutionize our knowledge of the dwarf worlds that dominate the planetary census of our solar system. And I'll wager that in the wake of these two explorations, calls for new missions to further investigate the exotic and diverse dwarf planet population of the solar system will be made — after all, the dwarfs hold a wealth of information on the mid-stage of the planet building process. Now I want to briefly recap the encounter of New Horizons with asteroid 2002 JF56, something I wrote about with some anticipation last month, as the planning for this event was taking place. Because the opportunity to fly by this small asteroid came up only in May, our mission and payload operations planning teams had to swing quickly into action. It took long hours of work, but they planned and executed this encounter in just six weeks. On June 11 and 13, observations of 2002 JF56 were made with the Ralph MVIC color camera, MVIC's panchromatic cameras, and Ralph's LEISA infrared imaging spectrometer. Ralph MVIC imagery of asteroid 2002 JF56 made on June 13, 2006, as New Horizons flew by it at a relative speed of over 70,000 km/hour. As hoped for, the moving asteroid was sharply resolved and stars were smeared as the spacecraft tracked on the position of the moving asteroid. Because we flew far from "JF56"—just over 102,000 kilometers (65,000 miles). we weren't able to return the kind of spectacular images that dedicated asteroid missions do. But we nonetheless measured the color, photometric properties, size, and composition of JF56. And most importantly, as noted above, we proved we could correctly "point and shoot" at moving targets. The composite of image snippets below shows this, revealing Ralph MVIC images of both JF56 and nearby stars. As you can see, the stars were streaked but JF56 was as steady as we could ever have hoped for. This gives us the warm glow of direct experience to build confidence in our tracking of moving targets for the New Horizons flybys of Jupiter next year, Pluto in 2015, and the Kuiper Belt thereafter. Owing to the great success of this flyby test, I've nominated the name "Johns Hopkins Applied Physics Lab" to the International Astronomical Union for 2002 JF56. Caltech's Jet Propulsion Lab has had an asteroid named after it for some years now, and I really can't think of a better moniker for the New Horizons target than one that honors the APL team who made New Horizons happen. Go New Horizons, Go APL! Before closing out this column, I also want to report that a team of astronomers successfully captured an occultation of a star by Pluto last month, on June 12. These kinds of events are rare but valuable. They are rare because Pluto's size is so small (just under 0.1 arcseconds, or 1/40,000 of a degree in diameter) that it rarely gets in front of a star of useable brightness. Occultation events are valuable primarily because they allow us to probe the structure of Pluto's atmosphere. It takes painstaking work just to accurately predict the occurrence of such events, and even more work to stage expeditionary teams to observatories and even more remote sites with portable telescopes. The June 12 occultation effort was led by Dr. Leslie Young, the New Horizons deputy project scientist and an expert in the study of planetary atmospheres. Other New Horizons team members like Drs. Cathy Olkin and Eliot Young participated in both the planning and observing at various locales. This particular event was best observed in Australia and New Zealand, where Pluto's shadow passed over the Earth. Best positioned there was Dr. Richard G. French of Wellesley College, an occultation studies expert, who was at the 3.6-meter diameter Anglo-Australian Telescope near Coonabarabran, New South Wales (see http://www.coonabarabran.com/ and http://www.daviddarling.info/encyclopedia/A/AAT.html ). The data retrieved by Dr. French and others in Australia and New Zealand on June 12 show that Pluto's atmosphere today is a lot like it was at the time of two occultation events in 2002, but fairly different than in 1980s occultation events. Most specifically, Pluto's lower atmosphere seems to have undergone some kind of change in its haze content or thermal properties since the 1980s, when it passed perihelion (closest approach to the Sun). We'll have to wait a few months for data analysis to yield quantitative results, but I can say without reservation that Pluto's atmosphere "hasn't collapsed yet" (though there can be no guarantees about what will happen before we arrive in 2015). Meanwhile, New Horizons races Plutoward, to assay its atmosphere in exquisite detail. I'll close with one last tidbit. The New Horizons Jupiter Encounter Science Team (yes, JEST), led by Dr. Jeff Moore of NASA Ames and Dr. John Spencer of Southwest Research Institute, has turned in its Jupiter observation plan. This plan was formally communicated to the mission operations team in an all-day review on June 26. The Jupiter observing plan, which stretches from January to June 2007, has more than 500 separate observations in it. Observations resulting from this plan should yield major advances on everything in the Jupiter system from the Galilean satellites to the red spots to Jupiter's magnetosphere and aurora, and the Jovian rings. Now it's up to the mission planners to make this plan a reality. There's no doubt it'll be a challenge to plan for and execute hundreds of separate observations, but the mission ops team has signed up to give it their all, and I know they'll do a fantastic job sequencing as much as possible over the next few months. Well, that's all I have for now. Until next time, keep exploring!